Morning Star Estate is a rural property on the outskirts of Mornington. Over one hundred and forty years old the original Victorian era mansion called 'Sunnyside' still stands surrounded by thirty acres of vineyards and over twenty acres of exquisite gardens. Morning Star Estate overlooks Port Phillip Bay with magnificent views of the bay, Melbourne city and even the Bellarine Peninsula. Offering function facilities, four star accommodation including an executive suite with a spa bath, corporate facilities, vintage cellar, and of course the remarkable gardens. This magnificent property has experienced a number of transitions over the last century and a half from private ownership, being a training farm for delinquent boys in the 1930's run by the Franciscan Fathers to being a stud farm. During its reign The Catholic Church added a summer school, a gymnasium and priest quarters to the estate. In the early 1980's the estate was used as a horse stud farm before becoming severely, run down neglected and the gardens overgrown. Judy Barrett and her family have since restored the estate to its former glory and now lease all operations from food and beverage to function and accommodation to catering company Table Matters. The extensive gardens include an elaborate fountain and are now home to over 700 varieties of ornamental roses. The garden is open from 10 am daily, guided group tours are available by appointment. The vineyard boasts the oldest site of vine plantings on the Mornington Peninsula originally sown by the Franciscan Priests in 1932. The 'Morning Star Estate' 2002 vintage award winning Pinot Noir is still available today. The vineyards are now managed by the Frewer family from Jones Road vineyard producing the wine under the Sommersby Estate label. The boutique bed and breakfast hotel was originally the dormitory wing of the 'Morning Star Boys Home' opened in January 2002. The accommodation includes twenty rooms all with their own en suites. There is also an indoor heated spa, lounge and sun rooms and wheel chair facilities. See website for rates. The restaurant, open Wednesday to Sunday, offers an eclectic A La Carte menu promoting local produce developed by award winning chefs. 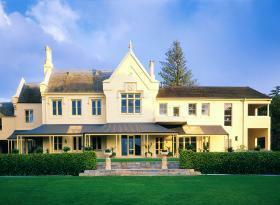 Situated in the original woodworking class room it overlooks the rose gardens and Port Phillip Bay. It's a contemporary restaurant with a reputation for the finest wining and dining on the Peninsula. Children catered for. Morning Star Estate also caters for functions, weddings, corporate events, concerts, fund-raisers and even memorial services. Function facilities include The Chardonnay Room, The Ballroom, The Chapel, The Theatre and The Sunken Garden. All functions can be catered for by Table Matters one of Melbourne's premier catering companies. Morning Star Estate is situated on Sunnyside Road Mt Eliza only 60kms from Melbourne CBD.